James Caan was an early crush; plus, the game seemed like ice hockey meets roller derby. Fun! As much as the stuff of our youth—the ephemera that our parents stashed in piano benches and shoeboxes—can weigh us down as we get older, it can also be revealing. When I was backreading Steve Erickson’s latest column for the magazine, on the subject of film violence, I thought about how much my own capacity to endure gore has diminished over the years. Then I remembered a treasure trove of “movie posters” that I created back in the mid-70s, when I was a little kid in an art class full of big kids. Thankfully (I think) my parents had saved the posters. Taking a look at them now—graphic homages to The Omen, The Exorcist, and Rollerball included—I can’t believe they didn’t land me in a child psychiatrist’s office. But they did inspire an entire Editor’s Note, which appears in the March issue. It will explain how the art came to be. For now, enjoy (?) 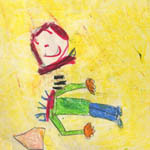 this glimpse inside the mind of an overly imaginative, slightly disturbed six-year-old.